In the April/May issue of ROCK IN JESUS, a review of the first album released by Love Song said, "You can hold us to this: 'Love Song' is one of the three best Jesus Rock albums yet produced." Behind that LP, now selling fairly well around the United States, there is a history of failures and successes experienced by many of the group's members: the same frustrations of many young people in their teen and college-age years. Love Song, now about two years old, have traveled from Minnesota to Florida from Dallas to Lawrence singing music designed not only to entertain, but to minister. It's all done without charge except for travel expenses-- and all the members of Love Song take their work extremely seriously. Chuck Girard, 28, is the founder of the group. He was raised as a Catholic, but at 15 parted ways with the church. Chuck told ROCK IN JESUS: "At that time, the whole trip of religion---goin' to church on Sunday and all that---- kind of seemed shallow to me. Some of the teachings of the church at that time were that if you missed church you were going to hell and all that. I decided if I was going to hell, might as well go to hell for something worth going to hell for, and not for just eating meat on Friday or missing church." So Girard began his late teens doing what he really loved: singing rock 'n' roll music in a band. He left home, "because my mother didn't know what to do with me," and began rebelling against all he'd been taught. In Chuck's words, "I slipped into sin." Girard did well for quite a while, singing backgrounds on recordings and cutting records himself. Bars and pool halls became his habitat when not recording. As was the case with many teens at that time, drinking was the "in" thing rather than drugs, because drugs weren't as much in the open as they are currently. He became restless because he realized he was doing no one any good by "sitting on a rock 2400 miles from nowhere." 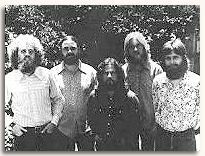 Admittedly confused, Girard returned to the States and joined a group named "Love Song" The group's gospel at that time was LSD, but Girard says their intentions were not malicious: They really thought the answer was in drugs. "I felt drugs were part of God's philosophy," he tells ROCK IN JESUS. An important step in Girard's spiritual life came when he was arrested in Las Vegas. He feels the Lord was in it, trying him. He relates that he had time between his arrest and trial to ponder the direction in which he was traveling. Then Chuck was introduced to the people at Calvary Chapel in Costa Mesa, California. He had heard about the chapel from various people; there was something different about the meetings there. But, at first, he recalls that he was skeptical and negative about going to the chapel. One of the things that impressed the 26-year-old singer was the simplicity of the music being sung at the chapel. But the simplicity was in the message of Christ presented there. Finally, Chuck reasoned, "Here's Jesus, who came down and led the perfect life, who was God incarnate, son of God, and all that, and He was the sacrifice for our sins, and by accepting Him into our life, this makes us alright with God." The decision seemed logical to him. At about that same time, all the members of Love Song were making definite decisions for Christ. They began singing some of their own songs in Calvary Chapel meetings. After that, their music ministry began on a full scale. They sang in churches, rock concerts, benefits and traveled spreading musically the good news of Jesus. Meanwhile, Love Song worked on the album that they finally released in March of 1972. With music ranging from soft Bread-type harmony to country rock music, Love Song put on record what many young thinking Christians had wanted to hear for a long time but couldn't find. Classified by Ahmet Ertegun, the President of Atlantic Records, as "contemporary gospel," the music provides a Bible message given in a tone of love. The LP is on the Good News label, founded by the members of Love Song for the express purpose of releasing their music without control or editing from a disinterested or "unenlightened" record company. United Artists, however, is handling distribution of the album for Love Song. Girard's views of Christian music were expressed when he told ROCK IN JESUS: "I believe that music can appeal to your flesh, your mind, and your spirit. So the more I can pare down the mind and the flesh, the more I can get to a person's spirit. Sometimes I can use a beat to involve a person who might not receive it any other way." However, Chuck is fully conscious of the danger of causing someone to stumble. "I feel that it a song would appeal to a person in a sexual or a sensual way, I don't care what the lyric would be, I'd try to find a different way to format it. We try to be really careful in our arrangement and our presentation of a song so we don't stumble anybody. We're not trying to be a great rock band. We're trying to get people to know about Jesus through music they can enjoy, and a person doesn't have to be rock and rolled to death to enjoy music.)) But Girard feels that the group has an exciting message to tell. "We've had the best the world had to offer, and it's nothing compared to life in Jesus Christ and the peace of mind of not having to worry about being arrested for drugs and all that. It takes a tremendous psychological burden off of you, knowing you're right with God. I just praise the Lord for it." Do all adults agree with the type of music Love Song employs for getting across the message of Jesus! As with all bands, the answer is no. Chuck told ROCK IN JESUS: "I think it'd be very hard for me, if I were 55 or 62 to believe right off the bat that this is all right on. Some of it isn't. Let's go back a couple of steps and realize what the whole long-haired thing started out to be. The original thing was rebellion, counter-culture, and drugs, and it's very hard---not so much now as when it first started---for some older folks to grasp the sincerity of long-haired Christians." Bob Wall, who plays guitar in Love Song, feels much the same as Chuck when it comes to the responsibility of maintaining integrity within the group so as not to be a stumbling block. Bob told ROCK IN JESUS, "My relationship with Christ is like this: Number one and foremost, it's one of worship. When you recognize Christ as God, it's almost tantamount to accepting him in your heart. By accepting Christ as God, you're also accepting the facts that he lived, he died, he was raised from the dead, and he was the Son of God, and therefore reigns with God and is God, and is to be worshipped." "Number two, the second part of the relationship, is servitude. We've all dedicated our lives to doing things that are going to further the knowledge of the public and the human races of what Jesus had to say and teach, and the message of salvation that he brought to the world." "As part of that relationship, what we really want to do is travel and play and make records. Records are really important, because we think that a lot of music that comes out these days put out by so-called "Jesus-loving people" isn't really sincere. It's just like when dope came along, it was a big deal to write a song about dope. You weren't 'in' and 'cool' and 'groovy' unless you were writing a song about dope, but anybody knows, man, that you can't really get behind writing a song about dope until you take it. Then, your songs about dope are going to explode into a true dope song." "it's the same thing about Jesus. Until you've experienced deep down inside the feeling and the knowledge that you've accepted Christ as your Lord and Savior, that he lives in your heart and reigns in your life, then you really can't write songs that are truthful and right on. That's why we wonder about some "Jesus Rock" groups, because the songs they sing and the lives they lead go down different roads. The songs go one way and end up with Jesus, but the lives go another way and end up in a ditch." "I do think, though, it's part of an honest search for a lot of people. But if they're misled in their own thinking, then the lyrics of their songs may mislead someone else. When I read your article, ("When Is Jesus Rock Not Jesus Rock," ROCK IN JESUS, Feb/Mar 1972), where it said that "each reader should approach ROCK IN JESUS as he or she should approach any religious publication: in an attitude of prayer, "I thought that was really good, because that's God's promise in the Bible: that if we seek to know the truth He's gonna give us the truth and the truth is gonna set US free." "If I look at the Stones' new album, for instance, and I'm really wondering whether the song in there about Christ is right on or not, then I go to prayer and ask the Lord for discernment and a word on whether I should be listening to it at all or whether I should throw the record in the ash can." "We really think that people shouldn't just go out and buy anything that says "Jesus" on it because they think they're gonna find the answer there. The answer is in the word of God. It's in nobody's lyrics." "That's why we put reference Bible verses on the jacket of our album, so people can see in the Bible what we're singing about. We also put a letter on the back of the album that tells pretty much where we're at. It was written by Chuck Girard for the people who would be looking at the LP before buying it." The other members of Love Song: Tom Coomes, Jay Truax, and John Raines, express the same desire: To minister rather than entertain, to work for Christ rather than sit and complain about world problems. john says of Christ: my Father. He's my whole purpose." "Jesus is the Lord. God and I aren't gonna save the world. It's more like I'm His servant. But He doesn't call me his servant. He calls me his friend. He's just my everything." The future is just as beautiful for Love Song as for any Christian: Work to be done on Earth for the Lord, Heaven awaiting when their work on earth is finished. New recording studios have been provided for Love Song and Good News Records, from which much more modern Jesus music will emanate. Chuck summed it up to ROCK IN JESUS this way: "We're trying to help the Lord to bring the body of Christians together. This is the big job I see. And the Lord has always and always will provide for us. Gospel should be free. That's why we don't charge a fee to perform, just travel expenses. God provides so faithfully, it just blows my mind." He's my God. He's everything to me now.